On board a search for missing plane Jump to media player Six days after the Malaysia Airlines jet vanished, there are still no clues about what happened to it despite a wide search including the Indian Ocean. How a pilot deals with an emergency Jump to media player Commercial Boeing pilot Captain Philip Ryddell explains how pilots deal with an emergency and gives his thoughts on what could have happened to flight MH370. Images of 'possible plane sighting' Jump to media player Chinese authorities have published images of what they suggest may be three pieces of wreckage from the missing Malaysia Airlines plane. 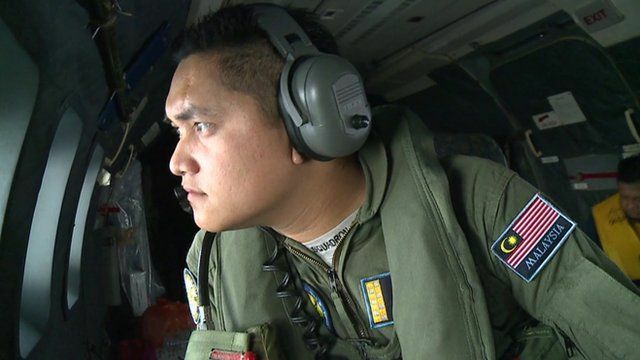 Chinese premier: 'We will not give up' Jump to media player Chinese Premier Li Keqiang has said "we will not give up on any suspected clue that has been found" as the search for the missing Malaysia Airlines flight MH370 continues. Plane: Debris images 'mistake' Jump to media player Chinese satellite images that were said to show debris from a missing Malaysian airliner were released by mistake, Malaysia's transport minister says. China lost plane images 'a mistake' Jump to media player China's Premier Li Keqiang has pledged to continue search efforts for the missing Malaysia Airlines flight "as long as there is a glimmer of hope". Six days after the Malaysia Airlines jet vanished, there are still no clues about what happened to it despite a wide search including the Indian Ocean. Rupert Wingfield-Hayes joined one aircraft that left Kuala Lumpur for its search area over the Strait of Malacca near Penang.